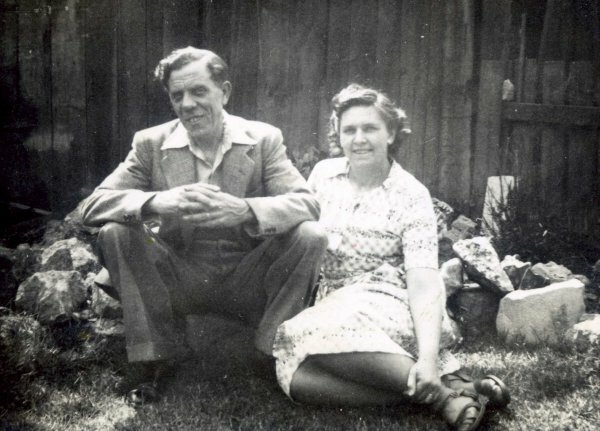 1912: Mar 14 - Fredrick and Eva were living at 7 Otway Street Chatham, Kent - Frederick was a Police Constable. Eva Ann (1885) Eva was born on Thursday January 22nd 1885 at Mattishall. There is no record of her baptism but she first attended Mattishall school on July 5th 1890, together with her younger sister Florence Kate Horne. The family were Primitive Methodist so she would have also attended the village Methodist Church, which was then behind the village store on church plain, now known as 'Tabnabs.' Eva was the daughter of William Mann Horne (1858) a Tailor of Mattishall and Bertha Dann - Eva's mother died on April 5th 1889 during a Flu Outbreak in Mattishall, Eva was just 4 years old. By a dreadful twist of fate it was an illness which would take Eva in 1918. 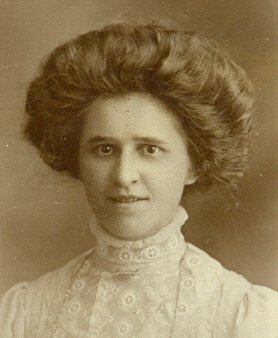 In 1901 we find Eva as a ‘Under Housemaid’ age 16 working for Charles B. Norgate a Solicitor and his wife Eliza together with there two children and two other domestic servants at 6 Quebec Street, East Dereham. 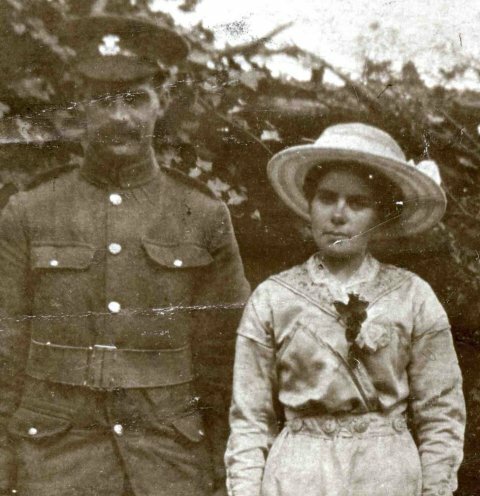 Sometime after this Eva had moved to London for in 1910 at the age of 25 Eva married 24 year old Frederick William O’Leary a full time boy Soldier at Kensington, London. Frederick William O’Leary was born in the March quarter of 1886 at Woolwich Kent the son of Edward O’Leary and Florence Mary Alberta Fisk. In the 1911 census it records Frederick as being born about 1886 at Woolwich Kent which confirms the above, he was recorded as a 'Gunner' in the 18 Company Royal Garrison Artillery Garrison Sheerness Military Barracks at Kent. During the 1914-1918 war the 18 Company manned the Eastern Coastal Defences. He must at sometime gone into action as later we discovered that he was wounded in the head - see below. The 1911 census shows Eva and Frederick were living apart, we assume as his military position did not give accommodation to wives of service personal. Eva was a 25 year old Domestic Cook working for 77 year old Widow Eugenia Moira, together with her 45 year old daughter Nina and two visitors from Paris at 56 Abingdon Villas Kensington West London. Eva and Frederick had two children: Molly Frances O'Leary born 1912 and Herbert Edward O'Leary born 1913. On Tuesday October 22nd 1918, Eva at the young age of 34 and heavily pregnant died at home (20 Percy Road, South Norwood, London), she died of Spanish Flu. Frederick's mother was attending to her at the time, she was recorded present at death. Frederick's mother lived in the same road at number 39. Twelve days later on Sunday November 3rd young Herbert O'Leary aged just 5 was to suffer the same fate, he also died of Spanish Flu. Again Frederick's mother was nursing him, this time at her house. 39 Percy Road. She was recorded also present at young Harry's death. She must have been distraught. It is hard to believe what she must have gone through, not only witnessing her daughter in-law dying in such an awful way and then we assume arranging and attending her funeral but then to go through the same thing all again losing her little grandson all within a few days. Armistice day was November 11th 1918, although the troops had begun to come home in the summer and with them came this virulent virus which could kill its victims in less than a day. It is claimed Spanish Flu took more lives than the war itself and more than the Black Death. The real victims of this tragedy are Fredrick and Molly for within a few days their whole lives had been shattered and changed forever. It is not clear where Eva and her young son Herbert are buried. Frederick remarried on April 26th 1919 to Edith L Herbert at Croydon, they were still living at Percy-road. However happiness was not to last - Frederick had survived the war, albeit wounded, he then endured the awful experience of losing his wife and son to Spanish Flu so we will never know how this all effected him or what went on in Fredericks mind, but from all accounts his wounds, the loss of his wife and his son must have been to much to take, for on, Thursday, April 21st, 1921 he took his own life. The widow Mrs. E. L. O’Leary, stated that deceased had been in the Army, and whilst discharged on June 26th, 1916, suffering from the effects of a shrapnel wound in the head. He was paralyzed in the right side, and witness believed that he had a piece of shrapnel in his head which could not be extracted. He always complained of pains in the head. Recently he had had an attack if influenza and only recommenced work on Tuesday last. Witness last saw him alive on Thursday morning. He then saw her off at South Norwood station when she went to London. Returning to her home that same evening, witness found the door locked, and receiving no answer, after knocking for some time, she went to he brother-in-law’s house and informed him. He brought a ladder, climbed in through one of the upstairs windows, and opened the front door. On entering witness proceeded to the kitchen and opening the door smelt gas. She rushed across and opened the window, and in doing so kicked the body of her husband, which was lying on the floor. In reply to the Coroner, witness said that when deceased saw her off at Norwood Junction he seemed strange in his manner. He had had fits of depression, but never threatened to take his life. One night last week, when suffering in his head, he asked witness to give him something to put him out of his misery. Frederick Wm Mummery, Percy-road, South Norwood, brother-in-law, stated that Mrs O’Leary came to his house on Thursday evening and asked him to force the door of her house as she could not enter. Witness procured a ladder and entered though one of the bedroom windows. He smelt gas strongly, and as Mrs O’Leary was almost in hysterics, he took her away. When he returned the body had been removed to the backyard. William Edward Stanley, labourer of Stanley-road, said he was called into the house by Mrs O’Leary. He went onto the kitchen, the door of which was ajar. Mrs O’Leary followed witness and witness also kicked the body, which was lying on the floor. He led Mrs O’Leary out of the room and then opened the doors and windows. Witness on looking round, saw the body on the floor, which was covered with a quilt. Witness did not touch the quilt, but ran out to the door to call the police. As he reached the doorway he met PC Fitzgerald. Dr. A.R. Mansell said when he examined the body it was quite cold. He was under the impression that deceased had been dead about two hours. The doctor attributed death to gas poisoning. P.S. Fitzgerald (30Z) said at 9:20pm on Thursday, he was called to the house and preceded to the kitchen saw the deceased lying down covered with a quilt. With assistance, witness carried the body to the yard and immediately sent for the doctor. Witness inspected the kitchen and found the tube of a gas ring has been attached to a bracket, and apparently deceased had placed this in his mouth. He also found a letter near by. Witness tried artificial respiration, but without effect. A verdict of “Suicide while of an unsound mind” was returned, and the Coroner remarked that the people who first arrived on the scene should have tried to first get the man out into the air. He, however greatly appreciated the prompt action of the Police Sergeant. The widow also thanked the police officer for his assistance. Husband of Eva Anna O'Leary (nee Horne) of South Norwood, London. It is not clear at this time why Fred served as Charles William Elder and Alias O'Leary?? It is also not known where Molly was at this time but she was now left orphaned at the age of 9. It is said that on hearing this dreadful news William Mann Horne 1858 (Molly's Grandfather) announced Molly could come to live with the Horne family at Mattishall, Norfolk. The death of his eldest daughter must have brought back a lot of memories and emotions for William for he must have recalled the awful time in 1889 when he lost his wife, Bertha Dann (Eva's mother) to the flu virus at the very young age of 30. However fate was to deal another blow, for William just a few days later fell from his horse and trap seriously damaging his back and after a few days of suffering much pain died on Thursday May 5th 1921. Therefore the plan for Molly to come to Norfolk never materialised and Molly was from all accounts placed elsewhere in London. Precise details are unclear at this time. It also appears that his mother’s family ties where around the St George Hanover Square area as she was born and married there twice and as we will see Florence and William would have six children all registered at St George Hanover Square. There is no marriage record of a Bertha that resembles this Bertha but there is an Amy B. This is just a guess!!!! 1903: Aug 20th - At the age of 19 Fred joined the Royal Garrison Artillery for a 9 year Short-Service - He cliamed he was Charles William Elder but alias Frederick William O'Leary. Service number 121469 - WHY, we may never know!! - So why this name, did it means someting to him or did he just make it up? - There was a Charles William Elder born Aug 10th 1850 at Kensington the son of Charles Elder an Historical and Portrate Painter and Caroline Geary who had married in 1845 at St Pancras. Frederick would have been on of the 129 bicycling police patrols in Kent. Each cycle patrol was issued with a forage cap, knickers and puttees. The forage cap being replaced in 1915 with a peaked cap. It is not quite clear to the precise details regarding Molly's early years following her father's death or where she lived as Molly never talked about it. 1921: the year of her father's death Molly was in "Guys" hospital next to London Bridge/The Shard. suffering from a TB hip. Mollie Frances O'Leary a Spinster age 19 a Assembler of 39 Percy Road, South Norwood. Fathers: William Rollinson a Labourer and Edward Francis O'Leary (Deseased) Master Tailor - Mollie has given her grandfather's name as her father. Wilfred Henry Alexanda Rollinson was born on Dec 1st 1902 (Mar quarter of 1903 at Croydon - 2a 290) the son of William Henry Rollinon a General Labourer in Building Construction and Jane Simpson who had married in the Sep quarter of 1902 at Croydon - In 1911 the family were living at 37 Percy Road South Norwood - Wilfred was 8 and at that time he had two younger brothers, Reginald, age 5 and Ronald, 4. Both Wilfred and Mollies ashes were placed in Plot 364 Gemini Niche at Croydon Cemetery.